As regular readers will know, I was really looking forward to seeing The Lego Movie with the children. We were lucky enough to go to a gala screening yesterday in Leicester Square, and boy did we have fun. 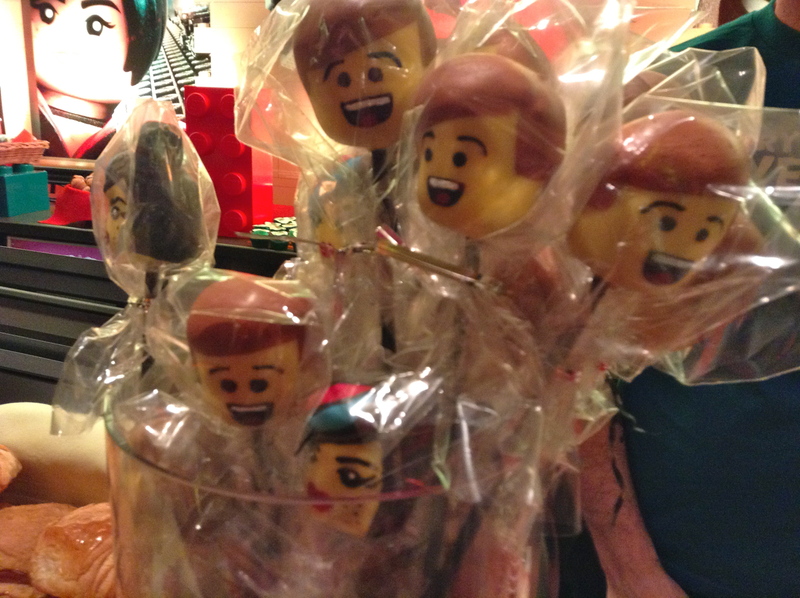 With Lego brick cookies, Lego man head biscuits and Emmet and Wyldstyle head cake pops beforehand, it was Lego central in the foyer beforehand. The movie? It was so exciting watching Lego City worlds in action – and the children found this truly magical. I tried to put myself in a 7-year-old’s shoes (not literally) and seeing your favourite Lego characters (including the fantastic Batman and 1980s space guy) and toys come to life on screen was “awesome”, in the words of our hero – average guy Emmet. The movie was really exciting, funny – with just the right balance of jokes for the kids and the grown-ups – fast-paced and visually spectacular. The plot was a little thin, it’s basically ‘let’s save the world from the baddie’, but frankly, who cares. The children adored it. I laughed, hell I may even have almost shed a tear. No spoilers here though – you’ll have to go and watch it yourself! Regular readers will know I am a huge fan of using Lego and other kids’ toys in my blog photos. So I am really looking forward to the new Lego movie which is released next year. As is my son. We have watched the trailer, ooh, fifteen times already and we’re already excited about The Biggest Movie Ever Assembled! I’ve already fallen for the cute animated ‘1980-something space guy’, as already featured on this very blog… Yes, I’ve got my husband’s vintage 80s space Lego, and I think I’ll hang on to it. Stay tuned for more updates on The Lego Movie!